You are invited to attend the 25th Annual Post-Acute and Long-Term Care Conference sponsored jointly by AMDA and CMDA - The Colorado Society for Post-Acute and Long-Term Care Medicine. CMDA is partnering with Colorado Health Care Association/ Colorado Center for Assisted Living (CHCA/CCAL) to present this conference. Register by April 19, 2019 to receive the discounted rate of $95 per attendee. Register 3 or more attendees from one organization for further discounts; see Registration details. Starting April 20, the registration rate will be $120 per attendee. This live activity is approved for a maximum of 7.5 AMA PRA Category 1 Credits ™. See details below. Online registration is required on the CMDA website, CMDA.us, using the 2019 Annual CMDA Conference tab. Payments are being accepted online. Cancelled registrations will be refunded, subject to a $10 fee. No refunds will be granted after April 22. If you have any questions, please email Holly Bodine at Holly.BodineCMDA@gmail.com. The CMDA Annual Conference draws over 300 participants from the field of post-acute and long-term care each year. Exhibitors and vendors who wish to network with high-level professionals and educate attendees on the latest industry products and services are invited to attend. Full and half-space display areas are now available! Questions? Contact Bonita Jones, bjones@cohca.org, or Ann Kokish, akokish@cohca.org. 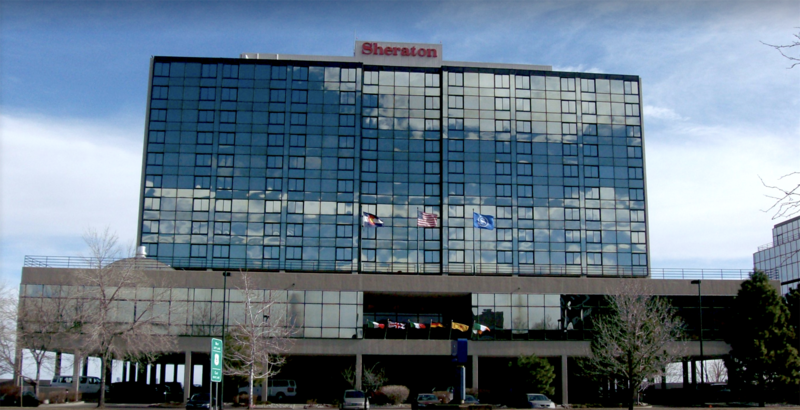 The conference will be held at the Sheraton Denver West Hotel, 360 Union Blvd., Lakewood, CO. Parking is available at the hotel parking lot and garage. Ample additional parking is available at the Federal Center Station RTD light rail parking lot, 11601 W 2nd Pl, Lakewood, CO, just East of the hotel parking garage. Carpooling and light rail use are encouraged. This live activity is approved for a maximum of 7.5 AMA PRA Category 1 Credits ™. Accreditation Statement: This activity has been planned and implemented in accordance with the accreditation requirements and policies of the Accreditation Council for Continuing Medical Education (ACCME) through the joint providership of AMDA-The Society for Post-Acute and Long-Term Care Medicine and The Colorado Society for Post-Acute and Long-Term Care Medicine. The AMDA-Society for Post-Acute and Long-Term Care Medicine is accredited by the ACCME to provide continuing medical education for physicians. This live activity is approved for a maximum of 7.5 AMA PRA Category 1 Credits ™. Physicians should claim credit commensurate with the extent of their participation in the activity. The 25th Annual CMDA Conference has been designated for 4.5 management and 3.0 clinical credits. CMD Credit Statement: This live activity has been pre-approved by the American Board of Post-Acute and Long-Term Care Medicine (ABPLM) for a total of 4.5 management hours and 3 clinical hours toward certification as a Certified Medical Director (CMD) in post-acute and long-term care medicine. The CMD program is administered by the ABPLM. Each physician should claim only those hours of credit actually spent on the activity.